There’s a bonus, here. Less waste and a much milder taste than a full on traditional pesto. Just as an aside, if you’re in to serious green smoothies, you’ll find another use for potential produce waste. 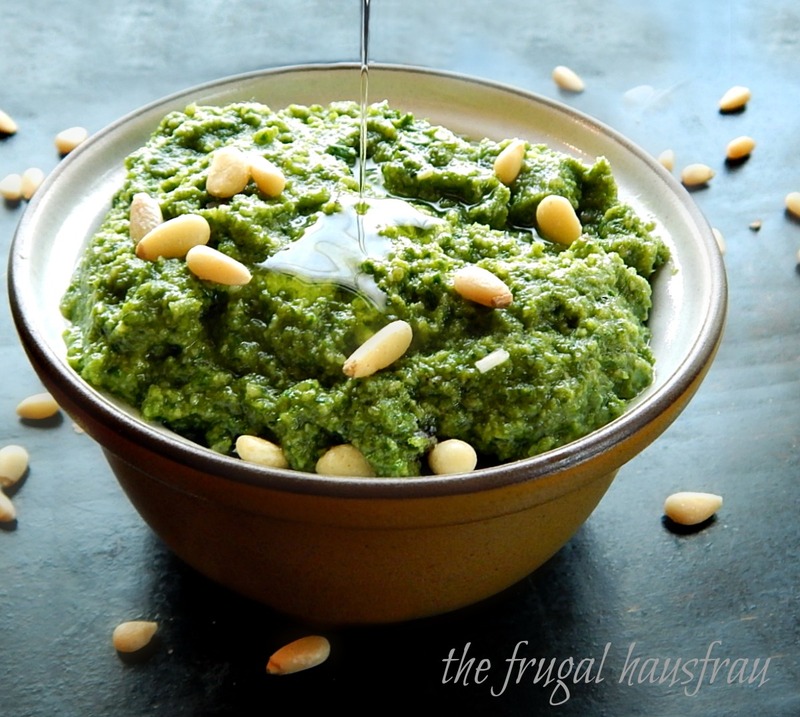 When you’re making a pesto like this, you can use pine nuts which are great, because they blend up creamy and taste marvelous, but they’re a little pricey. Experiment with any nut you like, or use no nuts at all. Radish tops are tasty, and nutritious, but frankly a little homely, so I don’t generally add them to salads. The leaves offer a lot of the same benefits as other cruciferous veggies. Add greens, nuts, salt and pepper to food processor. While pulsing, drizzle in olive oil. Scrape down sides. Add cheese and about 2 to 3 more times. If too thick, add a little more olive oil. Will keep in fridge for a couple days and freezes very well. I’ll be posting this recipe on Fiesta Friday #189; Fiesta Friday is an ongoing “link” party where bloggers join together and share their best recipes and party ideas of the week. This entry was posted in Click here for Fabulous Food Posts and tagged Cheese, Frugal Hausfrau, Nuts and Seeds, Pesto, radish. Bookmark the permalink. This is such a great idea! Thank you for sharing. Great ingredients and a great recipe! Good idea. I’ve tried spinach with basil, and a bunch of other different herbs, but never radish tops. Think I’m going to have to give this one to try because it looks really good. It really is, the problem is just how many radish tops you might have! Radish tops sounds delicious, but sadly not enough radish and certainly no tops here :). So, back to parsley etc. – also good. Thanks. YeahI had to add to the radish. They’re skimpy. But no radishes…that’s so sad! Beautiful! Imho I think the stems are just so full of flavor. I save them in the freezer and throw them into my soup or chickpeas when I cook them. too! I agree, and so often wasted! That’s a marvelous idea! Hugs on the wing! Thanks Teagan! I’ll be home soon and not at the folks, so I plan on devoting a lot more time to your blog and your wonderful stories! Hugs back! Oh, you are so kind. Thistledown and\or Jazz Age Wednesdays are here. No worries. Hugs!